In my job at the College Library I get to see, handle and browse through a lot of fascinating books, both old and new, but it’s rare to find time to sit down and read these books cover-to-cover. 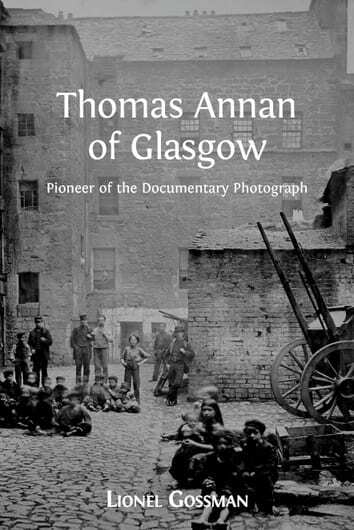 Over the Christmas holidays I took the opportunity to catch up on some reading and took home one of our latest acquisitions, Thomas Annan of Glasgow: Pioneer of the Documentary Photograph by Lionel Gossman. Thomas Annan (1829-1877) was an early Scottish photographer, probably best known for his photograph album, The Old Closes and Streets of Glasgow. He had a reputation as one of Scotland’s leading photographers, and in 1866 he was commissioned by the City of Glasgow Improvement Trust to capture images of the closes and wynds of old Glasgow that were scheduled for demolition under the Glasgow City Improvements Act. 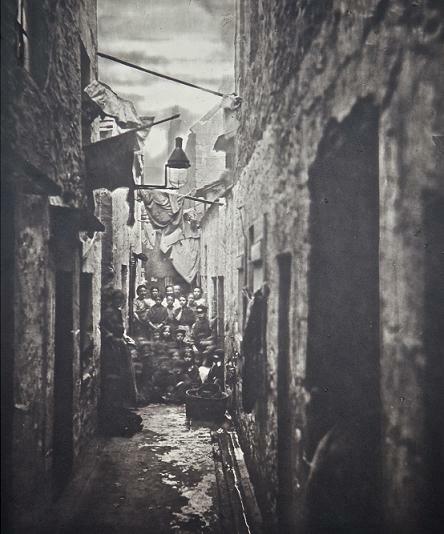 The album presents many fine examples of 19th century photography and Annan’s use of the carbon print process (for which he had secured exclusive usage rights for Scotland), and the images of the condemned slums and their inhabitants have since become iconic in Glasgow’s history. The College holds a copy of this album, presented by Glasgow’s Lord Provost John Ure to Dr Robert Scott Orr, President of the Faculty of the Physicians and Surgeons of Glasgow. Gossman’s book addresses the potentially problematic nature of Annan’s photographs of Glasgow’s slums. How accurate or unbiased are the photographs in their portrayal of the filth and squalor of these dwellings? Should the focus be on architecture or on social documentary? In other words, was Annan concerned with photographing the buildings themselves, or was he saying something about the lives of their inhabitants? Does it matter that these photographs were commissioned by the City Improvement Trust? Frustratingly, Annan himself does not provide any commentary on his work to help answer these question, save for a simple title or label. In addition to the Old Closes album, we also have a copy of Annan’s The Old Country Houses of the Glasgow Gentry (which we have written about previously) and Memorials of the Old College of Glasgow, which features images of the University of Glasgow at its previous location on High Street, before it moved to Gilmorehill in the city’s west end. The Old Closes and Streets of Glasgow is understandably the main focus of Gossman’s book, but a fair amount of attention is also paid to Annan’s portrait and landscape work (such as his photographs of the Loch Katrine water works). There is also some discussion of Annan’s contemporaries and predecessors, including the partnership of David Octavius Hill and Robert Adamson, two of Scotland’s earliest photographers. In a chapter on portraits, Annan’s 1864 portrait of the explorer and medical missionary David Livingstone is featured. The College holds a very interesting copy of this portrait, which Annan created by enlarging the photograph and painting over it in oils, almost like an early form of ‘painting by numbers’. The colouring process took place shortly after Livingstone’s death, a decade after the original portrait was made. The College purchased it from Annan for 30 guineas in 1875. Lionel Gossman’s book provides a sound overview of the beginnings of photography in 19th century Scotland, and sets Thomas Annan’s work in context before going on to discuss his most famous work in finer detail. Anyone with an interest in the history of Glasgow, documentary photography, or photography as an art form in the 19th century should fine something useful here. Members of the College can borrow the book from the College Library. It’s published by Open Book Publishers, which means it is also available to read online for free (with physical copies available for purchase).